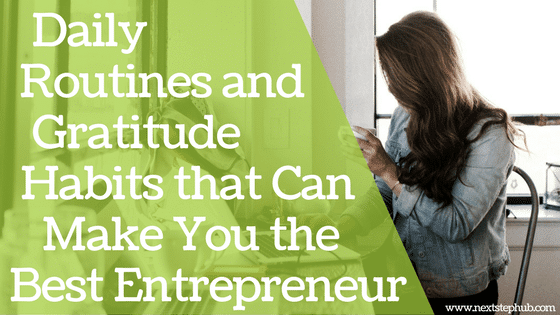 As an entrepreneur, creating daily routines and gratitude habits can help you excel in the business scene. In fact, successful innovators and personalities like Tim Ferriss, Oprah Winfrey, and Richard Branson claim to consciously practice gratitude. They make sure that they appreciate and acknowledge what they have, no matter how big or small they are. Being thankful and ready to show appreciation can make you a better person, business owner, and leader. Gratefulness can build meaningful connections, empower employees, and give your company a positive work culture. This week on Five Tips Tuesday, we’ll help you develop good routines and gratitude habits that can make you successful. Learn how optimism and gratitude work together. Discover the best Facebook advertising practice. Find out how to avoid distractions. Check out how you can be a visionary and an operator as a leader. Last but not the least, get the book that can help you teach techniques to foster gratitude every day. Gratitude and optimism go together. When you acknowledge the good things that you have, you’ll be happier. But as an entrepreneur, a positive mindset can be a challenging habit to have. Running a business is full of ups and downs, and sometimes, the struggles can affect your out view and mindset. Check out how an entrepreneur managed to keep a positive mind despite the hardships of his journey. Your habits on social media, especially on Facebook, can make or break your business. Many companies are using Facebook ads today to grow their business and reach their target audience. But according to Neil Patel, there’s an advertising habit that is silently hurting your business. Maintaining your focus is highly important to be successful, but it can also be a challenging habit to have. Distractions are everywhere. Every day, there are ‘shiny objects’ that can take you away from your path, like new marketing tactics or trends. Check out how Steve Jobs successfully dealt with these distractions. Many people think that visionaries and operators are two unique leadership styles. They believe that leaders can only excel either in building strategies or execution. The truth is, you need to master them both. You must have big ideas and promises and deliver them. Learn how you can excel in both strategy and execution here. According to many studies, gratitude is a simple yet scientifically proven way to increase happiness and peace in your life. Robert Emmons’ “The Little Book of Gratitude” will teach you easy tactics to nurture your gratitude. Emmons emphasized how small practices like writing thank you cards, meditating, and keeping a journal can improve your overall health and enhance your relationships. How do you form good daily routines and gratitude habits? Do you have other tips to add? Share it with us in the comments!